October 1940: he makes his first appearance on stage at the Ôsaka Kabukiza, playing under his real name in the play "Horikawa". February 1971: Kataoka Hidekimi takes the name of Kataoka Gatô V at the Ôsaka Shinkabukiza, playing the roles of the Priest Rôben and Haiya Saburôbei in the dramas "Nigatsudô" and "Sakura Shigure". The two programs at the Ôsaka Shinkabukiza commemorate the 36th anniversary (37th memorial service) of late Kataoka Nizaemon XI and celebrate the shûmei of Arashi Tokusaburô VII and the hatsubutai of Gatô's son Kataoka Shinnosuke. April 1976: revival in 5 acts and 9 scenes the National Theatre of Namiki Gohei I's drama "Kinmon Gosan no Kiri"; Gatô plays the roles of the yakko Yatahei, Junkikan and Katô Masakiyo [casting]. September 1978: revival at the National Theatre of Namiki Gohei I's drama "Suda no Haru Geisha Katagi"; Gatô plays the role of Genbêbori no Genbê [casting]. April 1981: revival at the National Theatre of Nishizawa Ippô's drama "Keisei Hama no Masago"; Gatô plays the role of Oda Nobuo [casting]. January 1997: tôshi kyôgen revival at the National Theatre of the drama "Dan no Ura Kabuto Gunki"; Gatô plays the role of Iwanaga Saemon Munetsura [casting]. November 2005: tôshi kyôgen revival at the National Theatre of the drama "Ehon Taikôki"; Gatô plays the role of Oda Harunaga [casting]. November 2014: the Annual Festive Face-Showing Grand Kabuki at the Kabukiza commemorates the 32nd anniversary (33rd memorial service) of the passing away of Matsumoto Hakuô I. His two sons, Matsumoto Kôshirô and Living National Treasure Nakamura Kichiemon, are the zagashira [more details]. Kataoka Gatô V is an outstanding tachiyaku actor of the Matsushimaya guild, endowed with an amazing voice (one of the best voices of Kabuki nowadays). 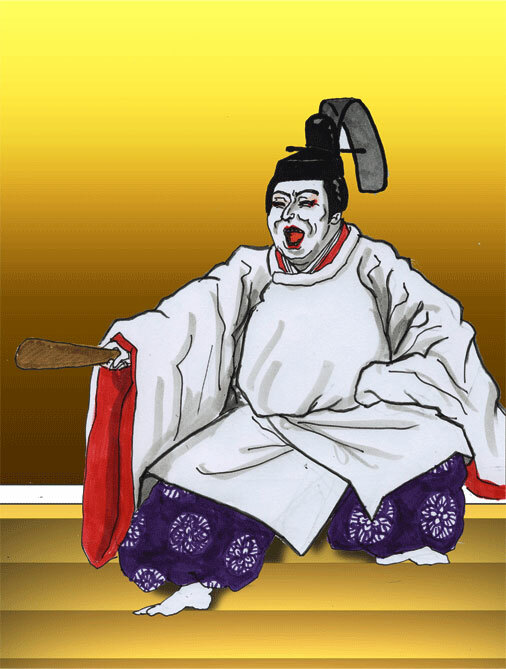 Kataoka Gatô V's best roles: Umeômaru ("Sugawara Denju Tenarai Kagami"), Soga Gorô ("Kotobuki Soga no Taimen"), Ishidô Umanojô ("Kanadehon Chûshingura"), Tanbaya Hachiemon ("Fûin Giri"), Kuheiji ("Sonezaki Shinjû"), Sakata Ichinosuke ("Toribeyama Shinjû"), Arajishi Otokonosuke ("Meiboku Sendai Hagi"), Fujiwara no Shihei ("Shihei no Nana Warai"), Yoshidaya Kizaemon ("Kuruwa Bunshô") and Mashiba Hisayoshi ("Ehon Taikôki").